I had the chance to preview I.N.C International Concepts' Spring 2011 line on Wednesday, October 27, 2010 at a fun and unique press preview in NYC. Instead of just having models standing and posing in the new collection, illustrator and designer, Richard Haines, was brought in to sketch giant drawings of the models and the I.N.C Spring 2011 look that they were wearing (as seen in the above photo). 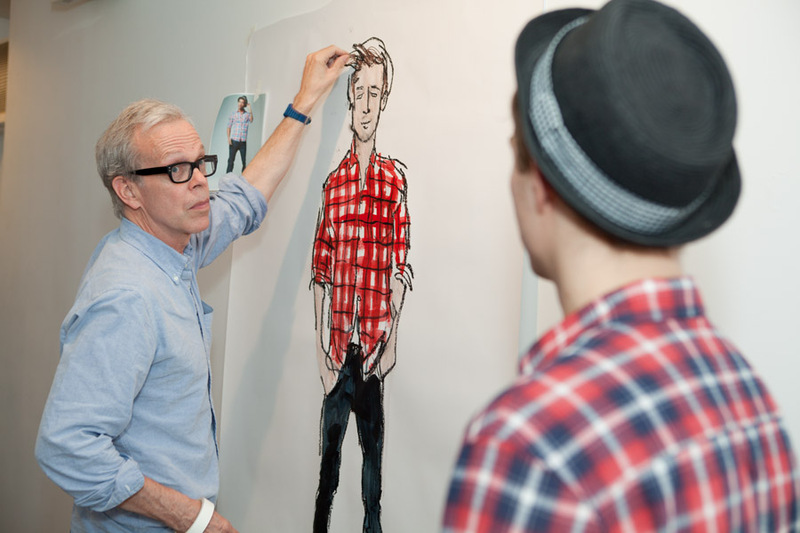 Richard Haines lent his talents to the design houses of Calvin Klien, Bill Blass, Perry Ellis and Sean Combs before devoting himself full time to fashion illustration. With his popular blog, What I saw Today, Haines finds a willing and engrossing muse in what he calls the "endless runway" that is his hometown of New York. His sketches show a unique understanding of men's fashion, revealing just as much about the wearer as they do the clothes. 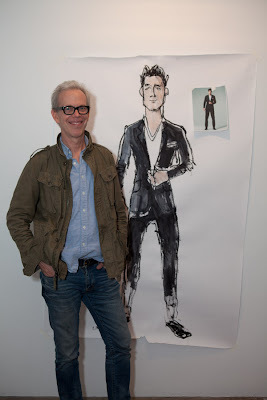 Above: Richard Haines stands next to one of his sketches. People at the even told me that they were surprised at how fast he can create each drawing. The I.N.C. Spring 2011 line actually fit in well with the currently warm temperatures in the city right now. 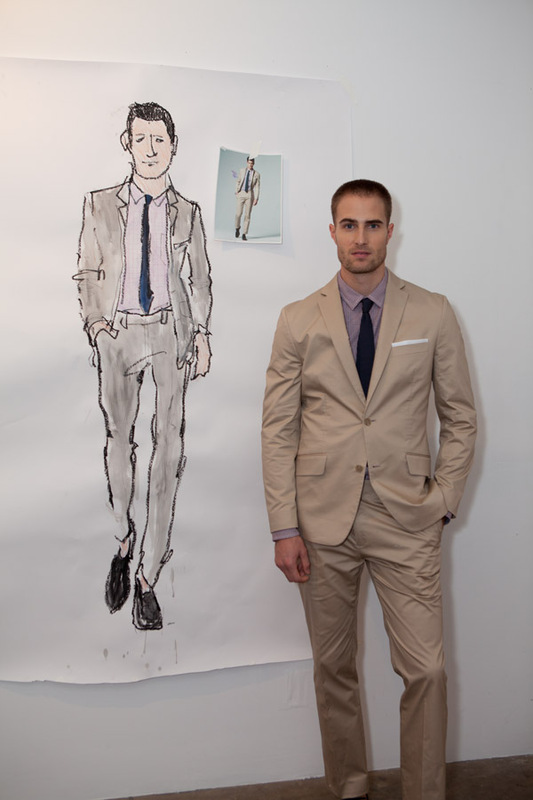 They had an individual take on looks from workday to weekend and had pieces that you could pair with so many things. I love companies like I.N.C. that have great basic pieces that look smart and can be paired and layered with so many things. It is also great to use some spring pieces as you transition into fall. Let's take a look at some of the looks that I loved! 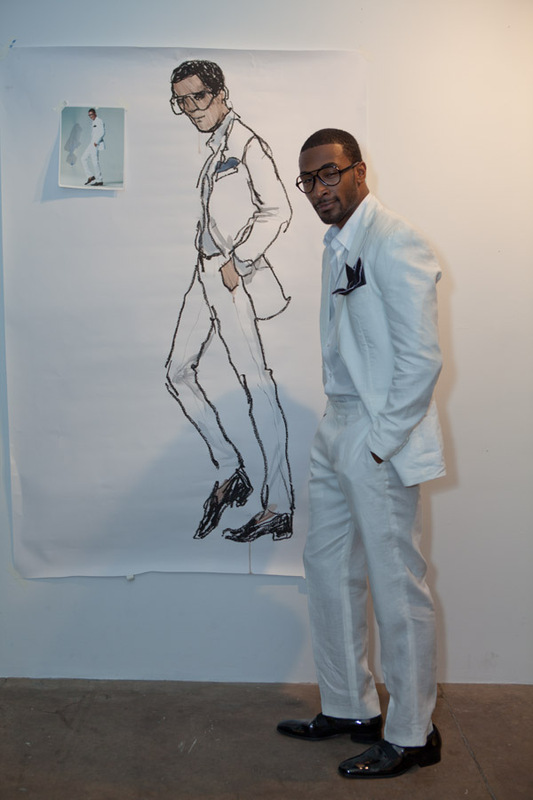 Above: I loved this all white look for Spring 2011. There is a lot that you can do with the jacket. You can casual it up with black or dark jeans or for warmer days a nice pair of dress shorts. I love the white tuxedo pant that you can pair with a gorgeous turquoise and white madra plaid or even a nice tee with some accessories. You can even roll them up a bit. It is all about having fun with clothes. Above: I feel like men are going to see a lot of tan in Spring 2011. You can do the same things with the jacket and pants as I mentioned above. I LOVE pairing neutrals with bold pops of color especially during Spring/Summer. Go with oranges, pinks and reds that are S/S 11's hot colors. Above: Tanks with prints and patterns were everywhere on men in the city this S/S and will probably be back for S/S 11 so start working on those arms! 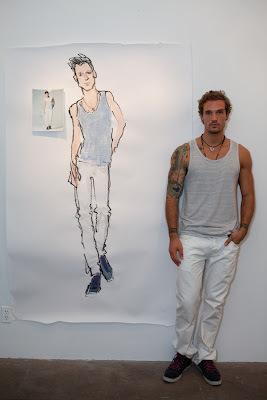 They are also key basic pieces to use as undershirts, etc. Above: A trend that I am really loving is that more and more guys are having fun with footwear. Gone are the days of one pair of brown and one pair of black. 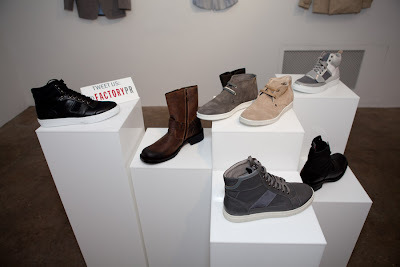 Guys have awesome sneakers, dress shoes and casual yet fun shoes to choose from now so please do so and have fun! 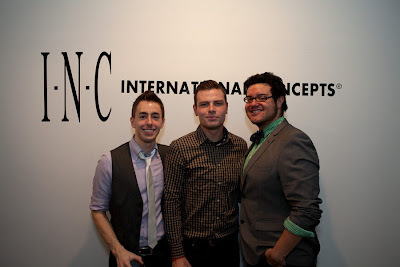 I had great time at the I.N.C International Concepts Spring 2011 press preview. You can look for this collection and the current one exclusively at Macy's. Above: Haute and the City's Tyler Williams, Model Clay Symes and OJ&B's Jonathan Valdez attend the I.N.C. Spring 2011 press preview.